Spring, spring is here. This morning, I grabbed my wee wonder of a camera and headed outside. The weather was so warm and sunny that I didn’t even need to wear a jacket. Now, readers in warmer places might not be impressed by my yard, but to me it is a glorious sight to behold. 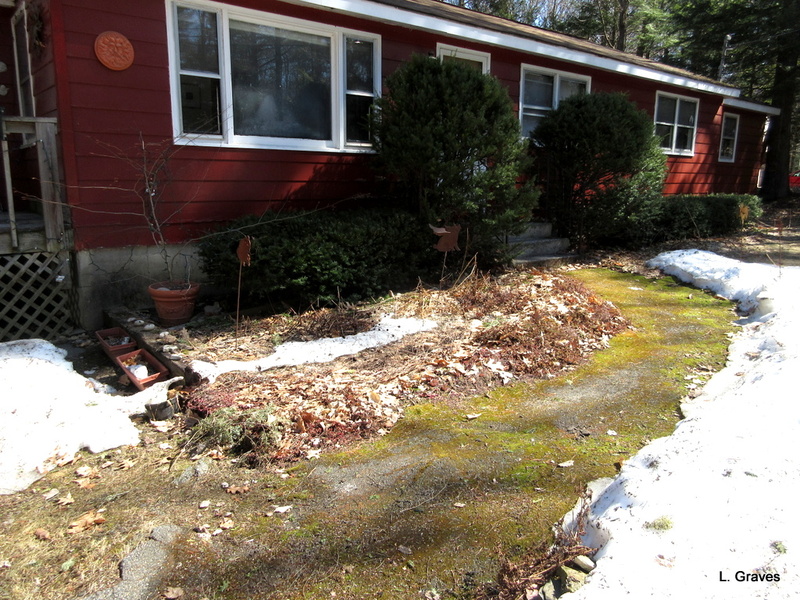 In the shady front yard, the snow is melting nicely. 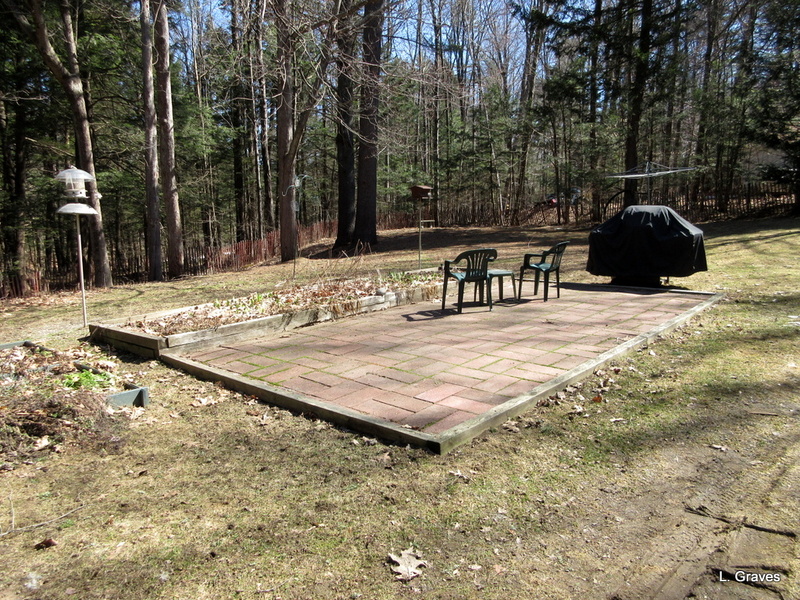 In the backyard, it is even better, with just a few patches of snow close to the house. 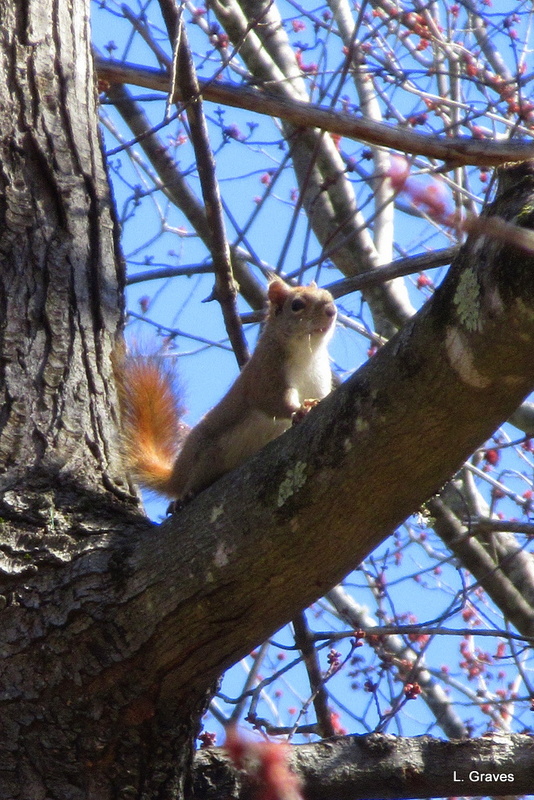 I sat down for a few minutes to enjoy the birds, the sun, the red buds, and the squirrels. I hated to go inside and sit at my desk, but there was work to do. However later on, I’ll be be back outside, cleaning the back garden, feeling the sun, and listening to the birds. There might even be drinks on the patio. I’ve dubbed our home “the little house in the big woods.” At 1,500 square feet, I suppose our home isn’t technically little, but by today’s standards, it is. And the woods go for miles, so I think it’s safe to call it a big woods. Actually, because of all the trees, our yard is not conducive to gardening. In fact, I joke that we have one of the worst yards in town for gardening. However, living in the forest does have its own consolations. So many birds! I think we’ll be celebrating a day early as Easter is supposed to be rainy. Clif and I never want to miss out on a celebration. For lunch, we plan to have crab rolls and whoopie pies on the patio. Enjoy! I am also reveling in the sun and the almost complete lack of snow. It feels good! It sure does! I like winter, but by the time April comes, enough is enough. Good for you! Nothing like a day of goofing to raise the spirits. Very warm in your neck of the woods. Definitely time to apply the sunscreen. I love the bird and squirrel pictures. I too had to grab my camera for some bud sightings. I need to put some pictures up, too. My garden is nowhere near Derrick’s but we have something going on as you do. 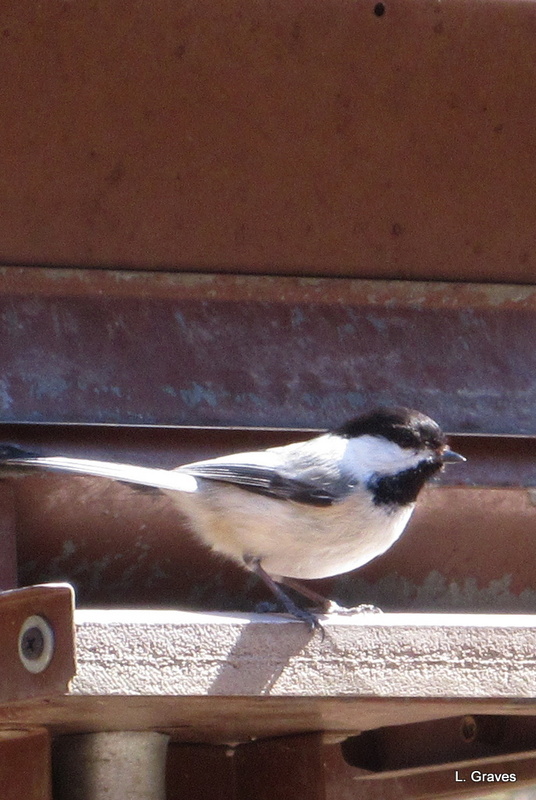 Is that a chickadee and a nuthatch? We have them too. Some of my favorites. A lovely record of the changes. Maybe hot drinks on the patio? Yes, please! I’d love to see pictures of your gardens. 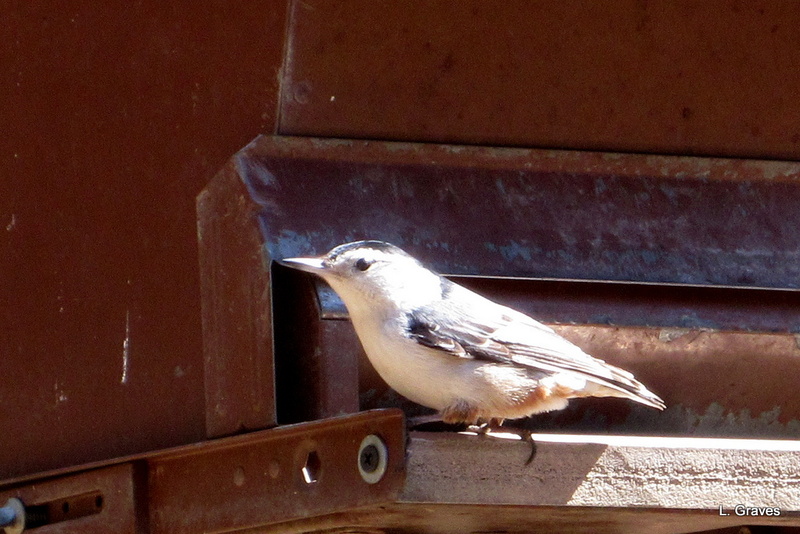 The birds are indeed a chickadee and a nuthatch. As a dear friend observed, they are plentiful but never common. I’m just like you, I keep inventing things I have to do outside. After being inside so much during the winter, we northerners like to be outside as much as we can as soon as the weather allows. And what a great one! Nothing gives me more pleasure than sitting on the patio and watching the fluttering, scampering, buzzing life around me. Hurrah for the end of snow! How lovely to live in a wood – and all that wildlife too! 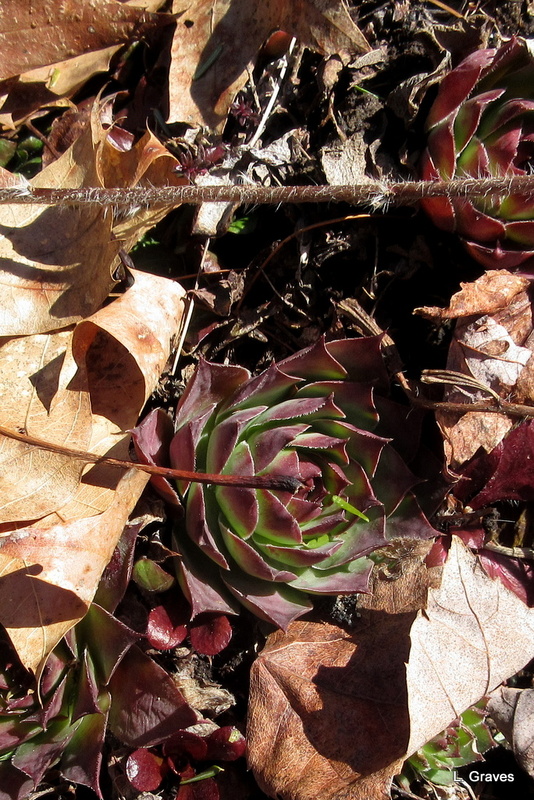 I enjoyed looking at your photos of the birds, squirrel and the sempervivum (house-leek) peeking out from under the leaves. Yes, very lovely to live in the woods with all the fluttering life around us.